Bryan, Christoph, and Aaron will be giving us an overview of their progress in organizing local OLPC groups in their countries, and ideas on how to expand OLPC LC/DC. Then we'll have an in-depth geek-fest and discussion around XO laptop usage right here in Washington DC. Be sure to bring your enthusiasm, your commitment, and of course, you shiny green G1G1 XO laptop! 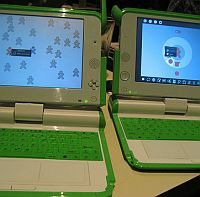 Is anyone interested in starting a Boston OLPC Learning Club? There is a Meetup in the metro Boston area http://modifyit.meetup.com/14/ , but it hasnt had any meetings yet. Man, I still can't believe I'm gonna be outta town for this meet-up! The guests sound great. I can't wait to see the write-up and hopefully some videos from this event. A lot of people will who ordered on the first day might not have them in hand yet even then. wow Wayan, you sound as if you already have your G1G1 laptop... do you already have shipping stats or something we dont know about? "Is anyone interested in starting a Boston OLPC Learning Club?" "There is a Meetup in the metro Boston area http://modifyit.meetup.com/14/"
I signed up as a "Maybe" for their next event, but I'd prefer a site in Boston/Cambridge/Somerville, or perhaps a bit to the north. Unfortunately that's the same night as my sons preschool holiday party, so I'll have to miss it. One less XO to mesh with. When's the January meeting?